[SatNews] Kratos Defense & Security Solutions, Inc. recently released their quantumCMD™, a lightweight, portable, command and control (C2) system that is specifically designed for small satellite missions. quantumCMD consolidates Telemetry, Tracking and Command functions in a single off-the-shelf product. As the industry seeks ways to reduce the cost of satellite missions, commercial and government operators are increaingly taking a look at solutions—such as small satellites—that are also known as microsats, CubeSats, nanosats, mini and microsats as they are compact alternatives than can be built and deployed at lower costs and with less risk to the operator. While traditional satellite missions can cost between $300 million to $1 billion or more, small satellite missions average between $1 million and $2 million—or even far less. Their many recent success have made the growth of the smallsat community one of the most exciting and impactful trends in the industry. quantumCMD brings the C2 aspects of the mission in line with the economics and scale that are required for small satellites. 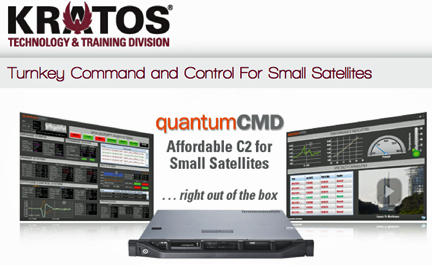 The industry’s first commercial-off-the-shelf (COTS), pre-integrated, turnkey smallsat C2 appliance—quantumCMD—includes all of the required hardware and software for small satellite operations. Among quantumCMD’s advanced features are complete automation capabilities that support a dynamic Concept of Operations (CONOPs), or even fully automated “lights-out” operations, if desired. Additionally, the built-in HTML5-based web server and browser-based interface enable anywhere access and operations, whether from a Satellite Operations Center (SOC), a laboratory, field installation or other environment. Operators can use the built in, drag-and-drop interface to quickly and easily create dashboards and a Common Operational Picture (COP) across multiple satellites, including a wide variety of alarms, charts, graphs and other visual tools, even video feeds. As this system uses accepted industry standards for functions such as data ingest, equipment control, and data export, directly out of the box quantumCMD supports most satellites and ground equipment used today by the smallsat community. This standards-based architecture also means that quantumCMD requires minimal customization, making it well suited to the shortened schedules, focused capabilities and reduced budgets that characterize small satellite missions. Tyvak Nano-Satellite Systems LLC (Tyvak) of Irvine, California, has purchased quantumCMD to perform C2 functions for its two Endeavor product line nanosats that will be launched as part of NASA’s CubeSat Proximity Operations Demonstration (CPOD) mission. Tyvak’s Endeavor nano-satellites represent a new generation of three-unit (3U) and 6U CubeSats that deliver precision attitude knowledge and control, higher power generation, distribution and storage, and higher performance on-board processing capabilities to address the growing need for nano-satellites that support operational and scientifically relevant missions. The CPOD mission will demonstrate the ability of two small nanos to remain at determined points relative to one another (station-keeping), as well as precision circumnavigation and docking using imaging sensors and a multi-thruster cold gas propulsion system. The ability of nano-satellites to operate in close proximity to each other is an important capability to enable on orbit inspection and servicing and to allow multiple satellites to operate in a coordinated manner in space. This precision maneuvering capability makes a robust and reliable C2 system critical. “quantumCMD showed us that it has the comprehensive capabilities and powerful features we were seeking for this important NASA mission,” said Charles S. “Scott” MacGillivray, President and CEO of Tyvak. “We were also extremely impressed with its flexibility, in particular the ability for us to easily create custom operational dashboards. At the end of the day, quantumCMD became the obvious choice with its ability to control multiple satellites as the CPOD mission demands. ”Kratos is also the maker of Epoch IPS, the industry’s leading solution for large satellite fleet C2, used by more than 75 percent of commercial satellite operator,s as well as governments around the world. quantumCMD incorporates Kratos’ more than 30 years of satellite operations experience and best practices, applying them to the unique demands of the growing small satellite market. For more information about quantum CMD, visit http://www.KratosDefense.com/quantumCMD.